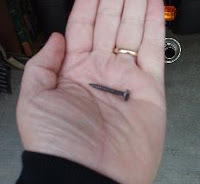 Dear drywall contractor who's working in my office building: I found one of your drywall screws in the parking lot last this morning -- in my rear tire! Call me Mr. Screw Magnet I guess; that's three in the last 13 months or so. This one had only gone 1,104 miles before losing its virginity, which works out to almost 15 cents per mile(!). On the bright side, I rarely ride around on a worn-out rear tire. Just as I was tilting it left into our under-building parking area, I felt the talltale "wumpa wumpa wumpa". 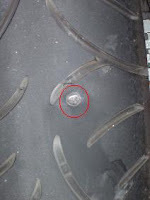 I put 'er up on the centerstand and spun the rear tire hoping to find a large stone, or small critter, wedged in the tread...but noooooo (John Belushi voice here). There it was, about 1/4" sticking out and no telling just how long it was. It was dark and about 36F, and I didn't want to risk pulling the screw out (no air was hissing) and then having a plug (I always carry a plug kit and pump) not work, so I fired it up and headed back home. After a few miles the "wumpa" stopped, which I knew meant either the screw had been pushed in flush with the tread, or that it had departed. It turned out to be the former 'cuz the tire felt just fine all the way home, although I did ride extra-conservatively just in case. So, while I'm waiting for the UPS man to bring me a new Bridgestone donut, I have a Kisan ChargeGuard gathering dust on my workbench and I've always wanted to feed more electrons to my (notoriously dim) ZR-7's headlight by rewiring the circuit to eliminate much of the voltage drop. Think I'll get a broom and give my parking area a good sweep, too.